UFC 221 is set to take place Saturday, February 10th in Australia. The fight card is full of intriguing fights highlighted by the main event which is the middleweight title fight between Yoel Romero and Luke Rockhold. The trash talk has already begun as Luke Rockhold was quoted as saying “I do everything better than Romero.” Romero is a fill-in for the original fighter Robert Whittaker who had to drop out due to injury. Even as an afterthought, Romero comes in as an experienced fighter who has been victorious in eight of his last nine fights. That being said, Romero has his hands full with Rockhold, who enters this fight after a TKO against David Branch in his last contest. Luke Rockhold out of the United States is 16-3 all-time. Rockhold is known for his kickboxing and jui jitsu skills in the octagon and also has some background in wrestling. He stands at 6’ 3” and 185 pounds and his height and reach are the primary advantages in this particular match. With a 77” reach, Rockhold has a monster 4” advantage over Romero, not to mention a 3” leg reach as well. Romero weighs in 185 as well but only standing at 6’ tall. Romero has considerable experience with a 12-2 all-time record but at 40 years old some wonder if his best days may be behind him. Make no mistake, even at 40 Romero is rock solid, but the seven-year age difference must give Luke Rockhold some sort of advantage. Romero’s best bet to win this match is to turn into a wrestling match, as that is his primary specialty. 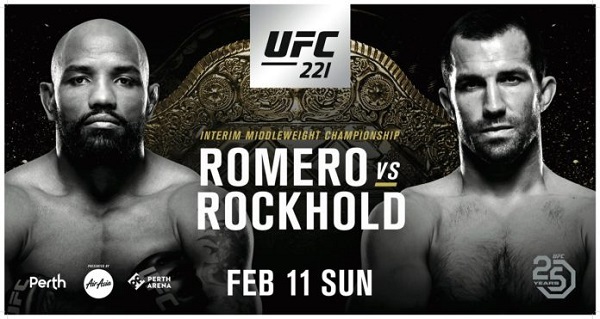 Romero, also known as the “Soldier of God”, may be the underdog to some and is the fill-in fighter, but he is actually the current #1 ranked middleweight fighter in UFC, while Rockhold is ranked #2. The numbers say that when it comes to punching, Rockhold lands many more punches per minute, but with less accuracy than Romero. Grappling is just the opposite, as Romero relies on takedowns far more often but with less accuracy than Rockhold. Rockhold has even already stated that he questions if Romero can hang with him in terms of grappling. Romero is also a strong defense fighter which may allow him to be able to extend the fight. Romero may not land many significant strikes per minute, but one does not want to test his power which is presented in his incredible 83% KO/TKO rate. These fighters who employ two different techniques make for an exciting fight. UFC 221’s main card is full of other great fights as well such as Hunt vs. Blaydes, Tuivasa vs. Asker, and Pedro vs. Safarov. Don’t sleep on the early prelims either as action kicks off at 6:30 PM ET, with the prelims at 8 PM, followed by the main card at 10 PM. Rockhold, Romero, may the best man win. For MMA odds for UFC 221 and all other MMA odds be sure to visit www.betphoenix.ag.